The biliary system has intrahepatic and extrahepatic components. The intrahepatic elements begin with the bile canaliculi between the hepatocytes, which lead into the canals of Herring at the edge of the liver lobules, which drain into the bile ductules and ducts within the portal tracts. The intrahepatic bile ducts drain towards the hilum of the liver, uniting en route. The fused duts leave the liver as the right and left hepatic ducts, which are the first part of the extrahepatic biliary system. The right and left hepatic ducts join to form the common hepatic duct. The cystic duct allows the lumen of the gallbladder to communicate with the rest of the bilary system. The point of union with the common hepatic duct with the cystic duct marks the start of the common bile duct. The common bile ducts descends and passes behind the first part of the duodenum and empties into the lumen of the second part of the duodenum via the ampulla of Vater. 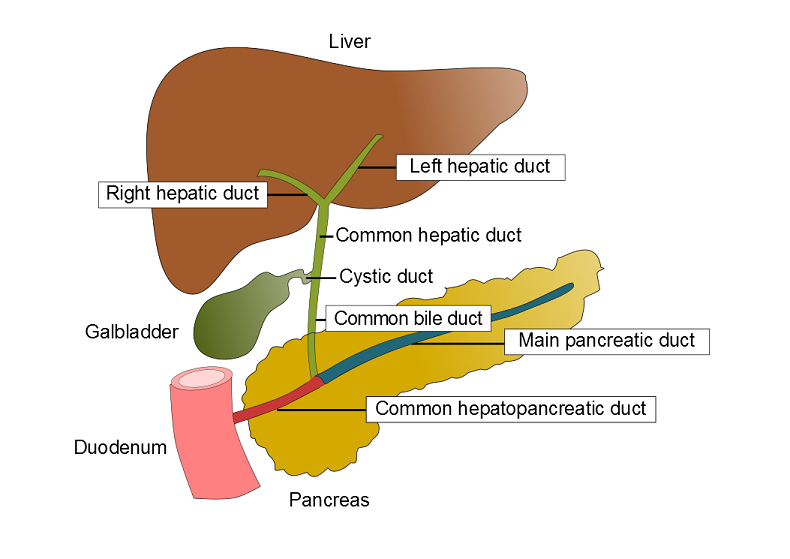 For a very short distance the common bile duct is usually fused with the main pancreatic duct just prior to the opening in the ampulla. The opening of the ampulla of Vater is controlled by the spinchter of Oddi. The gallbladder is a hollow, muscular organ that has a capacity of around 30-50ml and a wall thickness of approximately 2mm. It is located on the visceral surface of the liver. The portion of the gallbladder the protrudes below the lower border of the liver is called the fundus. The body of the gallbladder constitutes the majority of the gallbladder. The neck of the gallbladder links the body with the cystic duct. The gallbladder possesses a mild variation on the standard pattern of layers that is encountered throughout the gastrointestinal tract. The innermost layer is the mucosa. A submucosa is not present, so the muscularis propria is next to the mucosa. The outer layer of the gallbladder is adventitia in some places and serosa in those that are covered by peritoneum (the fundus and sides). The various extrahepatic biliary ducts also adopt this organisation of their layers, although the muscularis propria is usually insubstantial. The blood supply of the gallbladder is provided by the cystic artery, which is a branch of the right hepatic artery. The mucosa of the gallbladder is columnar and is folded. It is often described as having a velvety quality and is usually stained green by bile. The physiology of the biliary system encompasses the production of bile by hepatocytes, its delivery to the duodenum and its function in the small intestine. Bile drains through the intrahepatic ducts into the right and left hepatic ducts, then the common hepatic duct and into the gallbladder via the cystic duct. The gallbladder then concentrates and stores the bile until it is needed. The gallbladder may be able to concentrate bile by a factor of up to five to ten times. Contraction of the gallbladder squeezes bile back along the cystic duct into the common bile duct and into the duodenum through the ampulla of Vater. Contraction of the gallbladder is stimulated by the GI tract hormones cholecystokinin and indirectly by secretin. These two hormones are released by the small bowel when a meal enters it. The function of bile is to emulsify fats in the aqueous environment of the lumen of the small bowel and thus permit them to be ezymatically digested and then absorbed. Diseases which interfere with the delivery of bile to the small bowel can therefore be associated with the impaired absorption of fats. This malabsorption can include the fat soluble vitamins, A, D, E and K.
The biliary system also permits a few waste products to be excreted into the small bowel and ultimately the faeces. The biliary system secretes 500-1000ml of bile per day. Bile is rich in bicarbonate, which helps to neutralise the gastric acid that enters the duodenum. The majority (50-67%) of the dry weight of the bile is contributed by bile acids (also known as bile salts) which are responsible for the emulsifying action of bile on lipids. Bile acids possess both a hydrophobic and hydrophilic region and this allows them to emulsify fats in an aqueous environment. The bile salts are made by hepatocytes from cholesterol and are secreted into the bile canaliculi. The main bile acids are cholic acid and chenodeoxycholic acid. They are typically secreted in a conjugated form, in which they are joined to glycine or taurine. Within the lumen of the small bowel bile acids undergo dehydroxylation to secondary bile acids (deoxycholic acid and lithocolic acid). The bile acids pass along the lumen of the small bowel to the terminal ileum, where they are reabsorbed by active transport mechanisms and enter the portal circulation to be returned to the liver, where they rejoin the cycle. During the digestion of one meal the bile acids may circulate through the system between two to five times. Approximately 500mg of bile salts per day fail to be reasborbed, out of a total bile acid mass of 1400-3500mg. Bile acids are not the only contents of bile. The remainder is contributed by bilirubin, cholesterol, phospholipids and a small quantity of protein.